Our unit's do-it-yourself (DIY) series is still going strong. I am excited to report a successful sauerkraut class. Everyone was excited to get their hands in the cabbage and work together. There are still more classes in the series, so check out our remaining classes. I grew up knowing the word "sauerkraut" but not really understanding what it was (same with coleslaw). Now I know it is a fermented concoction of cabbage – salty, tangy, a little sour, crunchy, and, to the surprise of my kid-self, rather tasty. The basics are salt and cabbage. Salting draws out water from the cabbage, creating a brine liquid for cabbage to ferment in. When we put the cabbage in an anaerobic environment (no oxygen), bacteria start to create lactic acid, which preserves the cabbage. 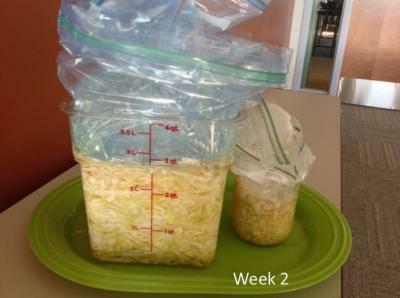 The salt limits any harmful bacteria from surviving, and lets good bacteria ferment the cabbage. With these bacteria, sauerkraut is a source of probiotics. These are healthful bacteria in foods that can help promote gut health. Our gut is already housed with bacteria, and supplying it with healthful bacteria may help crowd out harmful bacteria. I enjoyed sampling the sauerkraut straight from the container, but a whole bowl of it is too much. University of Alaska Fairbanks Cooperative Extension has a great set of recipes that use kraut, as does Oregon State University Cooperative Service. While you can buy a crock for fermenting, you only need a large food-safe container or several glass jars to get started. You can watch the sauerkraut making video – staring this author – for more information. Also see the recipe here. Remember, do not reduce the amount of salt, or your kraut may not ferment properly.